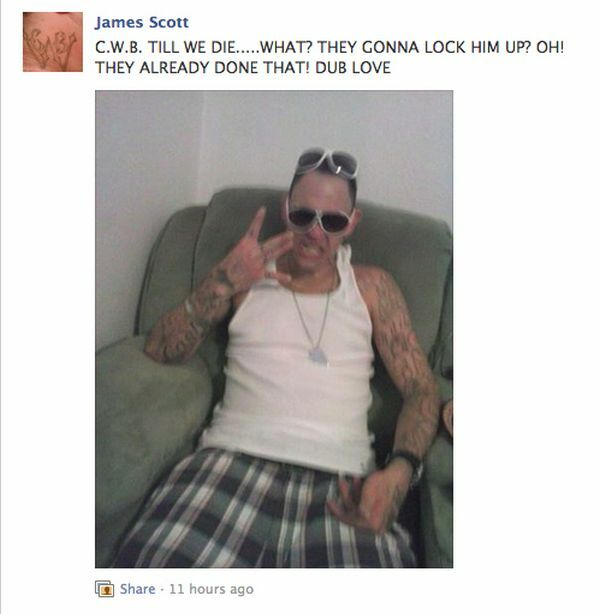 Don't post your photos on Facebook if you are a gang member. Otherwise, you will get busted. The two men below are convicted felons Mario Daniel McDonald and Joseph Wayne Edwards. 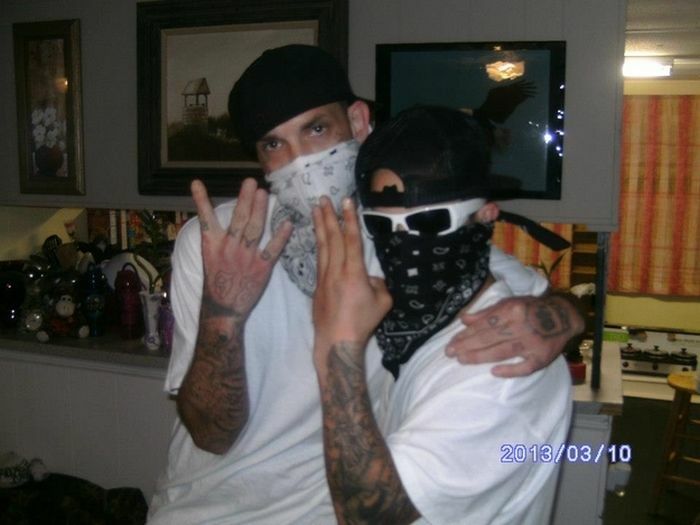 The duo belong to the Crazy White Boyz street gang and were recently arrested by Marion County Sheriff’s Office detectives for violating their parole by posing with firearms on Facebook. 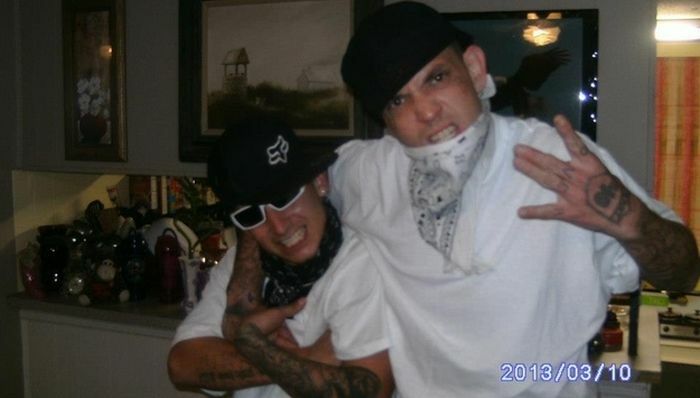 The two appear to have deleted the photos, but many of their photos show one or both flashing the Crazy White Boyz gang sing, pictured right. Part of their arrest referenced their use of Facebook to promote and further the interests of a criminal street gang. 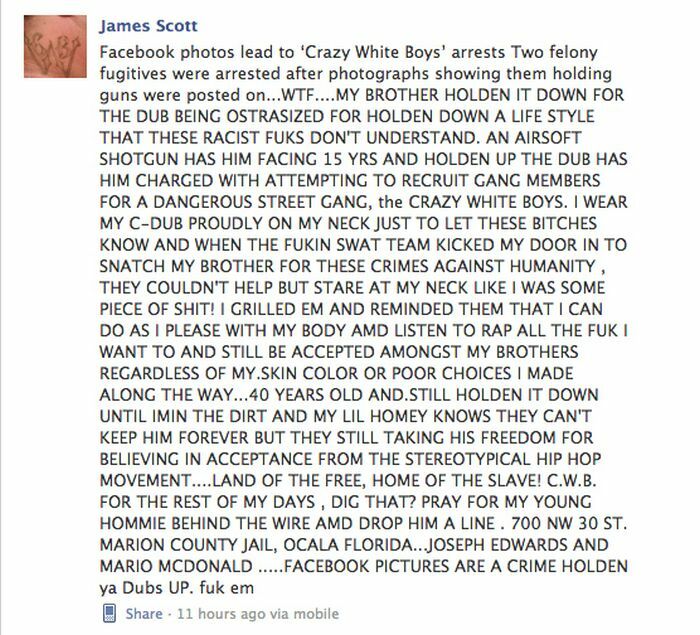 Perhaps making things worse for McDonald and Edwards, the public Crazy White Boyz Facebook group has been referencing the arrest. 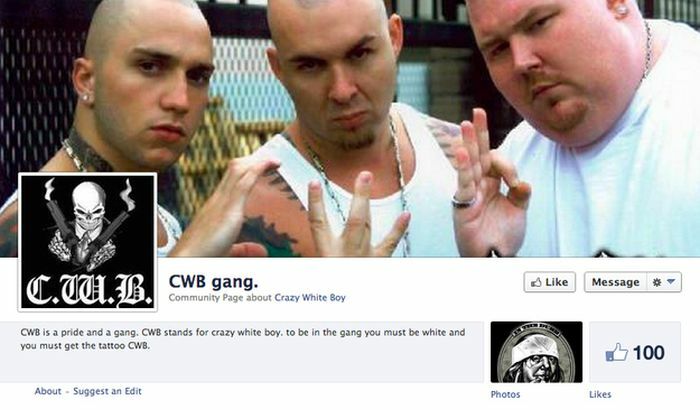 Perhaps The Crazy White Boyz should reconsider having a public Facebook group for gang activity. They have a public Facebook Page too. "Crazy White Trash" wasn't catchy enough. Are these guys posing with dishes behind them and a cute painting on the wall? They're keeping it real at their mom's house? What an bunch of utter worthless , childish , pathetic bellends .. So they are trying to be Black cuz black people are cooler. Pretty Pathetic! Seriously, you're forty and the most you aspire to in life is poor grammar and utter stupidity? Just die already.